Pilots know that you can stall the wing at any airspeed and in any flight attitude. A stall is all about angle of attack. But it’s hard to demonstrate the concept in a typical normal-category airplane. In this video, I show a series of accelerated stalls during loops in the Extra 300L. As you can see, I can change the aircraft’s attitude almost instantly while the airplane continues along its flight path, creating a large angle of attack, and therefore, an aerodynamic stall, even when the airplane is nose-low relative to the horizon and flying well above the normal stall speed. I have prepared my own comments on the new policy, which you can read below. RE: Agency/Docket Number: FAA-2013-0809 / Document Number: 2013-31094. I am disappointed to learn of the “Notice of Policy Change for the Use of FAA Approved Training Devices” published in the Federal Register on January 2, 2014 (Agency/Docket Number: FAA-2013-0809 / Document Number: 2013-31094).The change, announced without consulting the flight training community, represents a step backward in encouraging and broadening the use of interactive tools that help pilots safely and efficiently learn critical concepts, develop fundamental skills, and maintain proficiency during initial training and throughout their flying careers. The new policy also runs counter to several of FAA’s own initiatives, from the approval of aviation training devices (ATD) to the emphasis on scenario-based training, both in FITS-oriented programs and in the latest editions of the practical test standards, which emphasize aeronautical decision making, resource management, and related skills that are ideally suited for introduction and practice in training devices. Indeed, FAA-accepted FITS syllabi all emphasize the use of training devices from lesson one. The ultimate goal is to reduce the number of aviation accidents and incidents by emphasizing and addressing the perennial cause of most crashes—pilot error. In short, FITS focuses on teaching you to think like a pilot. All of those goals are best addressed by using a combination of tools and resources—including and especially simulation—during training. The Aviation Instructor’s Handbook (FAA-H-8083-9A), while not specifically addressing flight simulation, emphasizes the value of interactive technologies (see, for example, “Instructional Aids and Training Technologies” in Chapter 4, “The Teaching Process”). The GA flight-training industry, airline, and military flight training programs all make extensive use of simulation, including part-task trainers and training devices (even those not specifically approved by FAA), because these tools have proven their value. …a training platform for at least the procedural aspects of flight relating to an integrated ground and flight instrument training curriculum. Provides a training platform for both procedural and operational performance tasks related to ground and flight training towards private pilot, commercial pilot, and airline transport pilot certificates, a flight instructor certificate, and instrument rating. Note that both of those descriptions emphasize “integrated ground and flight instruction” and “procedural and operational tasks.” ATDs are deliberately named Aviation Training Devices (not simulators) because the primary goal in using them isn’t to hone stick-and-rudder skills in a specific make and model of aircraft. Instead, as noted above, they are tools that help aviators, throughout their training, think like pilots. The policy change is apparently an attempt to update FAA guidance with respect to the rapidly developing technology of flight simulation. But focusing on details such as display refresh rates and latency (in milliseconds) and the form of the physical controls for a simulation also runs counter to FAA’s own standards for ATDs and various levels of FTD. (2) Aircraft performance parameters (such as maximum speed, cruise speed, stall speed, maximum climb rate, and hovering/sideward/forward/rearward flight) should be comparable to the aircraft or family of aircraft being represented. The GA community is using this evolving simulation technology to provide increasingly effective training capabilities at reduced cost…FAA has determined that instructors can successfully teach procedural understanding of certain flight tasks during training using the flight simulation devices described in this AC. FAA has presented no evidence that the current system of LOAs and technical standards for ATDs and FTDs has led to significant issues in training or proficiency because the devices themselves are somehow technically deficient, obsolete, or poorly maintained. Indeed, competition and innovation in the industry continues to drive the introduction of improved and more capable training devices. Allow trainees and instructors to explore realistic scenarios that may be impractical or unsafe in an aircraft. Policy changes that discourage the use of training devices by making compliance and approval needlessly expensive and time-consuming (both for the industry and overworked FAA inspectors) run counter to FAA’s laudable goal of reducing accident rates, pilot deviations, and related issues. FAA should promote—not encumber—the use of ATDs and FTDs and, as always, rely on the professionalism of flight instructors, training providers, and the network of DPEs to ensure that pilots earning new certificates and ratings are prepared to be aviators. 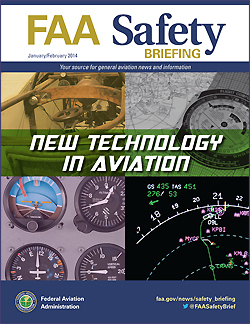 The January/February 2014 issue of FAA Safety Briefing includes a feature, “Lights, Camera, Action!” that discusses using video cameras in aircraft. The method of installation matters in terms of whether FAA approval is required. If the camera is a secondary portable unit hand carried onboard (inside the aircraft), the FAA typically will not get involved. Most cameras used by GA pilots are self-contained, portable, and sufficiently lightweight to have no appreciable impact. The method of mounting the camera, however, still has to be evaluated and installed or attached using a method acceptable to the FAA. For example, a yoke-mounted iPad holder has no appreciable effect on handling the aircraft, and these devices do not affect airworthiness. If, on the other hand, the installation is attached to the aircraft by hard-point methods such as bolts and screws, or if it interfaces with aircraft navigation or electrical systems, it becomes a major alteration because it may appreciably affect airworthiness. This kind of installation requires use of other FAA-approved data or a field approval evaluation. Methods such as glue, suction cups, or duct tape are typically not acceptable, in part because their failure could cause harm to the aircraft or persons on the ground or in the aircraft. The bottom line is that all installations require some sort of approval. Each must be evaluated for its application and complexity to ensure safety. If you have a question, start by calling your local Flight Standards District Office (FSDO). As I’ve noted elsewhere, Sport Aviation, EAA’s main magazine, also explored the use of video cameras on and in aircraft in “Pilot’s-Eye View,” a feature in the February 2013 issue.